The mess that comes with immorality. 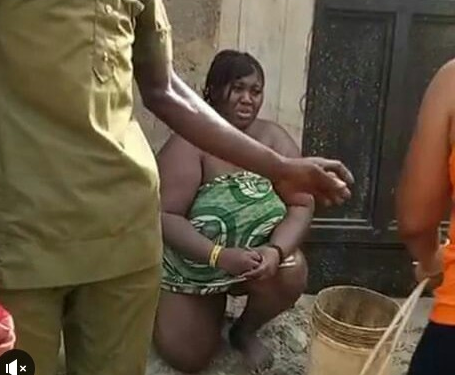 In a trending clip making rounds on social media, a married lady was seen mercilessly flogging the fat woman kneeling in the photo above. The angry wife said the woman did not sleep with her husband, but had the guts to tie her "expensive wrapper" on her body right in her matrimonial home. 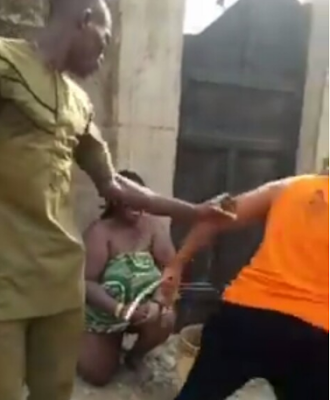 The furious wife, who was heard ranting in her native (Igbo) language, asked the woman what gave her the guts to come to her house, sleep with her husband and tie her wrapper. What a mess!